I get a kick out of studying litter. I've already shown you 280 cans and bottles on this page. Someday I'll post my gallery of banana peels. I photograph each and every banana peel I see. They're all different, and sometimes they tell a story. Today's story is about this paint-roller tray that I found on South King Street near the church. As you'll observe, somebody had run over it. 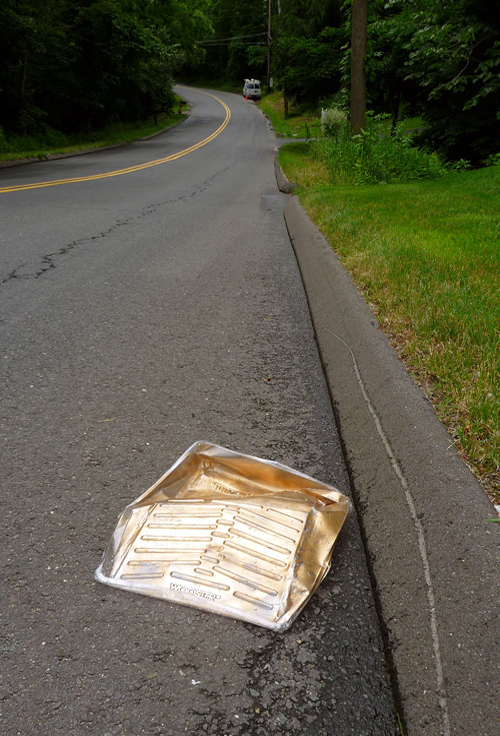 You might think the tray was dropped by someone in the van parked down the street, but I included that just to throw you off. I had passed the van a minute earlier, and I can tell you that even though it had stepladders on top, no painters were on board. A Comcast crew was working on the white electrical box attached to the pole down there. You should have known that the guys in the van didn't drop the paint tray, because a) why would they park so far away if they meant to come back and retrieve it? and b) why would they bother setting out an orange traffic cone for that? And c), even if they did, how come we don't see them walking up the road in this picture? What happened, then? I don't see any other clues, except that the tray appears to be brand-new. This argues that it wasn't a professional painter who dropped it, because the pros use their trays over and over again, until they (the trays, not the painters) are coated with many layers of dried paint. Wait: here's another clue: The tray's brand name (faintly visible on the edge nearest the camera) is Wooster®. Googling "wooster paint," I discover that this is a Deluxe Metal tray from the Wooster Brush Company in Wooster, Ohio—a 158-year-old firm that invented the angled sash brush and the Exploded Tip® process to make nylon bristle tips soft and fuzzy. I also found that Wooster's nearest "alpha dealer" is in Bridgeport, an hour south of here. An alpha dealer probably resells to smaller "beta" shops—tiny stores that can't afford to buy in bulk. I think I know what happened. An amateur painter who lives in the neighborhood bought a gallon or two of paint to do a room. He or she (let's say "she" this time) probably bought it at Sears in the mall, five miles away. When she got home, she discovered she didn't have a tray. Eager to get started with the work, she drove to the little neighborhood hardware store exactly 0.8 miles from this spot—beside the gas station, the liquor store, and the 7-11—and purchased the tray. She was annoyed that she could have bought it cheaper at Sears. Distracted by her annoyance, she set the tray on the roof of her car while she searched for her keys in her purse. Then she got into the car and drove off—with the paint tray sitting on the roof. She noticed another car tailgating her, which added to her frustration. She sped up. Reaching the church, she turned right onto South King Street a little too fast, and the tray slid across the roof to the passenger side. She wondered, "What was that sound?" She thought no more of it, however, because now the tailgater was blowing his horn. The tray teetered on the edge of the roof for a few seconds, and fell off—and the tailgater ran over the tray. The woman didn't notice, though. Still furious over his tailgating, she sped down the road, triumphantly watching him receding in her rear-view mirror. The hardware store isn't open now. I should call tomorrow and ask the proprietor if he sold two Wooster paint trays today, about twenty minutes apart, and whether the person who bought then seemed a little pissed off.